2008 Moonbeam Awards Judging is Underway! Judging of this year’s contest is now underway, and the judges are amazed by the quality of books entered, and the creative energy that went into them. It gives us all great hope for the future to see how much children’s book authors and publishers care about the nurturing of young minds. We’ve counted up the entries and are happy to announce a 21% increase in participation this year. A total of 1,085 entries into our 30 categories divides up to an average of 36 books per category. Of course it didn’t work out that evenly – we sure didn’t get 36 pop-up book entries! In fact, the two largest categories, Best First Book and Picture Book 4-8 Year Old received 130 entries each. The next two largest categories are Best Illustrator with 92 entries and Pre-Teen Fiction with 85 entries. The smallest is the afore-mentioned Pop-up/Cut-out category, with just 5 entries. Semi-finalist results announced October 3, 2008. Final results announced October 17, 2008. 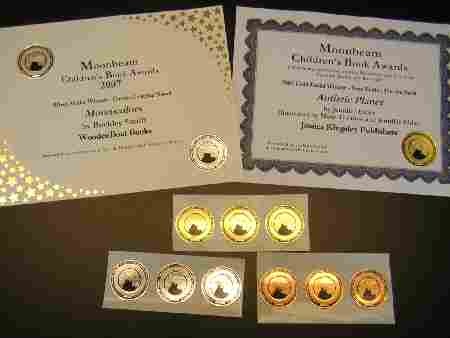 Entry for the Second Annual Moonbeam Children’s Book Awards officially closed on August 16th. Good Luck to all participants and stay tuned to find out who the winners are!